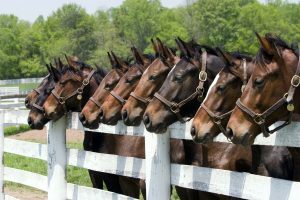 Since 1982, Ocala Breeders Feed & Supply has been solely dedicated to the production of horse feeds. We are located in the heart of horse country, Ocala, Florida. We guarantee fresh feed made with top quality food grade ingredients. Ocala Breeders Feed & Supply now has two retail locations in Ocala, Florida. Our line of high-quality horse feeds feature quality protein sources and added lysine, the first amino acid for horses. In addition to our top quality OBS horse feeds we stock Purina, Manna Pro, KER, Triple Crown and Cavalor horse feeds in our stores. Whether you’re in need of maintenance equine feed, breeding, training, or specialty feed we have you covered. We aim to keep your equine healthy and give them the optimal level of nutrition. In need of assistance with your equine feed? Ocala Breeders’ Feed and Supply will be glad to help analyze your program and access your horse’s nutritional needs to find the best fit for you. Our farm consultant is available by phone or through an on-site visit. Stop in one of our locations or browse some of our selection of horse feed below. And don’t forget that we are always happy to special order any feed for our customers.